Wonder what it feels like to work with a book editor in a traditional book publishing house? Here's what to expect. 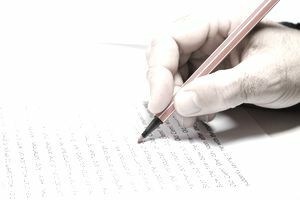 In the time since your literary agent sold your novel or non-fiction book proposal to a book publisher and you signed your book contract, you and your editor have likely had some back-and-forth about the content. Now, you've typed "The End" onto the last page of your book manuscript — your magnum opus is finally finished! Proud and exhausted, you deliver your properly-formatted manuscript on disk (maybe even with a hard copy) to your book editor. But you don't get to relax just yet. Next stop, your pages enter the book editing phase, the first stage in seeing a manuscript become a finished book. During the book editing stage, your editor is going to have a lot to say about the book's content, and you'll work together to arrive at an agreed-upon final manuscript. Note that the exact time between editing steps varies widely depending on the book's production schedule (highly padded? tight? a crash? ), and the individual editor (who's in a dozen or more meetings every week and has a slew of other books to edit). For example, you might wait a month for feedback on a chapter and then have only a couple of days to do a chapter rewrite — or vice versa. And there may be more or less back-and-forth at any stage in the editing process, depending on the extent and nature of the feedback and the requested changes. The author submits the manuscript to the editor according to the contractual due date (this is sometimes referred to as the first pass manuscript). The editor takes a first pass at the manuscript and makes (sometimes extensive) general comments, sometimes called a "developmental edit." (Most good editors will do some developmental editing during early chapters, prior to the manuscript's completion). These can be requests for additional text, cutting text, clarifying information, moving chapters around for the sake of narrative flow, etc. The revisions in the manuscript stage may be handled on the printed manuscript, electronically, or a combination of both. In any case, version control care is taken that there's one master electronic copy, so revisions aren't duplicated or lost. The editor then returns the manuscript to the author. The author revises the edited manuscript per the editor's instructions and resubmits it (the second pass). If artwork is expected from the author, it's likely expected in full by this time (note: there are usually guidelines as to how art is submitted, to ensure electronic art goes in its correct place and original art comes back intact). The editor line-edits the second edited manuscript — that is, he or she goes over it with a fine-tooth comb and asks for additional corrections, clarifications, and comments on artwork (if applicable); the editor returns the second manuscript to the author. The author makes all corrections, answers all queries and responds to all comments. A clean, final manuscript and matching disk (plus all final art, if applicable) goes to the editor. If the editor is happy with the edited manuscript at this stage, it is considered to be "accepted." Being "accepted" also means the author's "payment upon acceptance" clause in the book contract can finally be triggered and a check cut! (Note that for some non-fiction books, acceptance is also contingent upon legal review of the manuscript) and it moves on to be the copyeditor, to be copyedited. Copyediting is considered to be the first step in the book production process. Also, read about the parts of a book and book jackets and how they are designed.